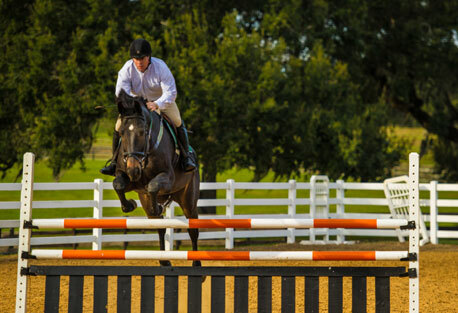 Golden Ocala Golf & Equestrian Club, Ocala FL invites visitors to Stay and Play in a luxury residence enjoying amenity specials designed exclusively for Play and Stay guests. Accommodations are now offered at 10 percent discounts on regular rental rate. Minimum stay is two nights. Amenity deals include equestrian riding lessons at $40 per hour, rounds of golf at $90 and private golf lessons with John Elliot Jr. at $180 per hour. A junior lesson is just $130 and golf clinics are $20 per person. Send me more information about this Golden Ocala getaway! Situated in the heart of horse country, Golden Ocala Golf & Equestrian Club is a 1,150-acre private, gated community with 24-hour security. Its championship 18-hole Ron Garl-designed golf course features eight professionally-recreated tribute holes modeling some of the world’s finest courses including Augusta, Royal Troon, Baltusrol, Muirfield and St. Andrews. Send me more information about this Golden Ocala getaway! Marion County is known as the Horse Capital of the World and home to many pristine natural areas, shopping and dining opportunities, museums, and performing arts venues. Ocala is less than an hour away from the quaint town of Micanopy, The University of Florida in Gainesville and the many exciting attractions of Orlando. Send me more information about this Golden Ocala getaway! Golden Ocala offers homesites and an array of new home options, from maintenance-free golf homes to expansive custom estates. The homes range in size from around 2,000 square feet to estates starting at 6,000 square feet and larger. Beautiful surroundings, amazing views and a host of amenities complement each and every home. The community is still expanding, with the latest addition, Eagles Landing, offering six floor plans from 1,560 to 2,120 sf, including townhomes and single-family casitas from the $250,000s. These lake and wood view homes feature 2-car attached garages, free maintenance and customizable upgrades and décor. Send me more information about this Golden Ocala getaway!